Studying abroad in the United States is both exciting and rewarding. Pursuing your academic and professional goals in a country so filled with opportunity — it is an experience that will enrich your education, your career and your life. 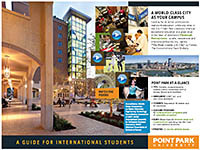 Point Park University is a comprehensive university in the U.S. that offers a unique and exceptional education. Located in the heart of Downtown Pittsburgh, Pennsylvania — a safe, inexpensive and international-friendly city, and named "The Most Livable U.S. City" by Forbes, The Economist and Rand McNally — we offer an active, professional, real-world education, unlike any other in the U.S.
You see many advantages to studying in the U.S., but no doubt you have questions and concerns, too. As an international student, you will be making great sacrifices - leaving behind family, friends, a familiar lifestyle and more. But rest assured, you will feel immediately at home at Point Park. Our University's Office of International Student Services and Enrollment is committed to meeting your every need as an international student. Our ISSE office serves as a single point of contact, guiding you every step of the way - through the application process, to your arrival on campus and throughout your four years at Point Park. Ease - We'll take care of all the details; you focus on your studies, without the complications. Convenience - You'll work with a single office, as we assist you with everything from the application process, scholarships and visa compliance, to employment advice, immigration issues past graduation and more. Family help - When your family needs answers, they will also have just one office and one number to call. Personal service - Our three-person office is highly individualized; you will know us, and we will know you. Scholarships - We offer very generous scholarships to make a Point Park education affordable. Activities and events - We sponsor programs and events throughout the year to help international students meet one another and integrate into the campus community. Our Office of International Student Services and Enrollment is ready to serve you. Whatever your question, whatever your need, please don't hesitate to contact us - by email, phone, fax, or postal mail. Office Hours: Monday,Thursday and Friday 8:30 a.m. to 4:30 p.m; Tuesday and Wednesday 8:30 a.m. to 6 p.m.